On Tuesday, May 14, 2013, a one-day Pacific Northwest Agroforestry Working Group Exploratory Workshop was held at the Oregon State University North Willamette Research and Extension Center in Aurora, Oregon. 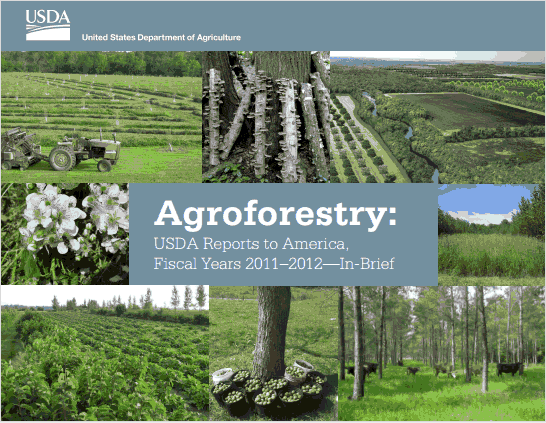 The workshop was organized at the request of the USDA National Agroforestry Center as part of their strategic plan to foster the science, practice and application of agroforestry in the U.S. The intention of the workshop organizers was to learn about the current status of PNW agroforestry education, research and outreach activities, and to ascertain the level of interest in forming an Agroforestry Working Group in our region, similar to those that have been formed in other parts of the country. This initial meeting linked 30 individuals from potential agroforestry-practicing agencies, universities, and institutes from Oregon, Washington, and Alaska with collaborators in Lincoln, Nebraska and Washington, D.C. We hope the workshop will energize the agroforestry community in the PNW and ignite interest in working together to promote the broader adoption of agroforestry practices, prioritize projects for initial collaboration, and identify potential funding sources. The meeting was kicked off with a welcome and opening remarks by Jim Johnson, OSU College of Forestry Associate Dean and Program Leader for Forestry and Natural Resources Extension. Following presentations by agroforestry practitioners, attendees participated in two break-out groups for facilitated discussions to explore key issues and identify potential areas of collaboration. Key issues: adding value for landowners; contributing to climate change resiliency; improving water quality and habitat for salmon and wildlife; diversifying rural economies through nontimber forest products. Barriers: need to develop markets; need to identify mechanisms to bring new products to market; need new data and shared access to existing data to demonstrate economic and ecological value of agroforestry projects; need incentives to install agroforestry projects on existing farmland. Areas of impact: Agroforestry was recognized as a comprehensive tool to help urban and rural residents adapt to climate change, provide wildlife habitat, improve water quality in PNW rivers and streams, help reduce fire risk, and add value for landowners. Agroforestry can broaden and pull together what various agencies, researchers, and land managers do. Climate change: The PNW is predicted to have wetter winters and hotter, drier summers. Diverse agroforestry products offer economic and ecological resilience - diversifying plants helps to minimize farmers' risk from changing climatic conditions, and growing trees sequester carbon. Rural windbreaks can reduce soil loss in dry summers and trees in agricultural landscapes can help reduce runoff. Water quality and habitat: Riparian buffers can contribute to riparian restoration through improved water quality and better salmon habitat. Buffers reduce erosion, absorb pollution, provide shade to water-quality-limited streams, improve wildlife habitat, and provide marketable products. Economic value: Silvopasture, forest farming, and payment for ecosystem services provided by agroforestry can offer economic opportunities for depressed forest-dependent communities. Riparian buffers and hedgerows can support insect-eating birds, help reduce chemical use, and sustain pollinators that are important for improved crop production. The group expressed interest in establishing a working group, with a desire to move forward carefully and schedule several additional meetings to identify key priorities, opportunities for collaboration, and explore potential funding sources.